Based on the cartoon series Alvin and the Chipmunks, this current live action incarnation stars Jason Lee as Dave Seville and Justin Long, Matthew Gray Gubler and Jesse McCartney as Alvin, Simon and Theodore, those three loveable chipmunks. Featuring state of the art CGI, this modern incarnation of "Alvin and the Chipmunks" will appeal to those adults who enjoyed the original series and also a new generation of children who will simply adore the characters and the songs of this movie. 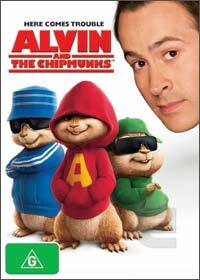 The story of course revolve around the chipmunks and their human friend Dave Seville, however when Alvin and his friends are relocated to Los Angeles from their forest, they come across the struggling song writer. This is where the clichés begin and the feel good movie starts as these chipmunks inspire Dave to sing again and help him to fall in love with his neighbor Claire (Cameron Richardson). Although not the most inspirational movie, Alvin and the Chipmunks pays great homage to the original cartoon series and songs that were released in the 1950's and 60's. Unfortunately the human actors are staged up by the CGI chipmunks who are the star of the movie and at the end of the day, this movie is a great family night in which contains action, romance, comedy and drama. Presented in an aspect ratio of 16:9 widescreen with Dolby Digital 5.1, the video quality is quite sharp with vibrant colours and no artifacting at all. Match that with quality Dolby Digital 5.1 and it's almost like being at the movies again with crystal clear sound. Some interesting special features, especially the history on Alvin and the gang.